It was a pleasure meeting soft-hearted, gentle cocker spaniel Pippa for a June photoshoot in 2015. Afterwards, her owners also sent pictures of how she looked as a puppy, and the result was two portraits of her, one as a youngster, and one as an old lady. Six months later, I received a call from her hum an family, explaining that Pippa had recently developed terminal bone cancer behind one eye, which, tragically, will have to be removed. I was touched when a family member kindly phoned me and said they were glad they had got her portrait done before her diagnosis, and commented that they remembered I had gone to a lot of trouble to get her eyes right. 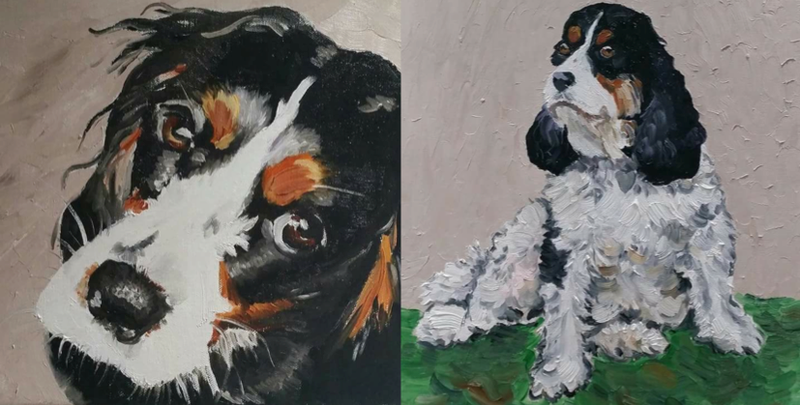 In these paintings, Pippa is remembered as the family knew and loved her for so many years.